It’s prudent for the budding musician to begin with a student-model instrument. But progress can be stunted if the violin isn’t properly setup by a professional. There is a great deal of difference between a student violin, an intermediate violin, and a professional violin. It has to do with craftsmanship and the quality of materials, which of course translates into a sizeable difference in price. Same with student-grade cellos and violas. Of course, even the greatest living violinists today were once students. Did they (or their parents) purchase or rent an instrument from a skilled violinmaker? Or were their first violins lower-cost, lower-grade instruments? Quite possible it was the latter. But what each probably had in common even in the birth of their musical careers was a proper setup for their student violins. 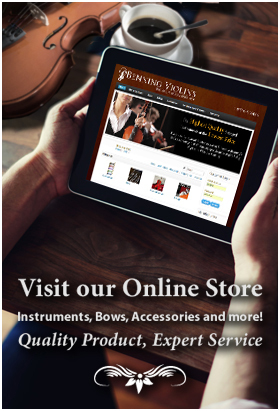 The reason violins – and violas, and cellos – need to be setup is simple: the mass-factory-produced brands are shipped to retailers and customers on ordinary boats, trains, and trucks. This might mean there is jostling in its transportation that can actually break joints. Some pieces have a tenuous connection to other parts, such as the soundpost, which is essentially a dowel that is wedged (no glue or other fastener) inside the violin and held in place by force of the strings that press down on the bridge. Each instrument requires attention and fine-tuning before being played. A reputable violin shop should perform those fine adjustments. That shop should have experience in setups and repairs of instruments. A high quality setup by a trained luthier can dramatically improve the tone and playability of the instrument, making violins, violas and cellos sound better and, most importantly, easier to play. Fingerboard – The fingerboard needs to be securely glued to its neck, which can become loose in transit. It also has a precise concave surface that sometimes needs to be planed to the proper curve. 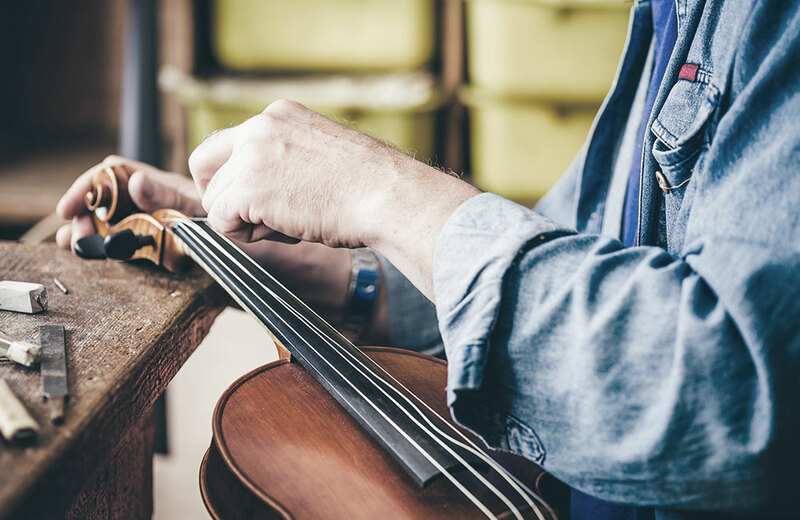 Soundpost – The master violinmakers call this the heart of the stringed instruments, partly because it is delicately placed inside the body of the violin and it greatly affects the tonal response. Maddeningly, there is not a standard place for it to go, with a range of about 5 millimeters differing distances from the bridge. The decision on where (i.e., to achieve what sound?) is typically made between a luthier and the musician. Tuning pegs – Lower quality wood allows slippage of the pegs because it has a looser hold from less friction. Students as well as professionals need to control the tautness of the strings; peg paste (or soap) can be added to ease turning the tuning pegs. Violin neck ­– Alas, a professional violin neck will be made with ebony but the lower cost instruments are black-stained wood of another (cheaper) type. Aged ebony is hard and holds its shape while stained wood can warp, resulting in a twist that throws the height of the strings off-kilter. In the worst cases, the net result of that is the instrument is very hard to play. The setup process returns the neck to the proper shape. There are several other factors to be address in a setup: the violin bridge, its finish (which affects both appearance and tone), the tailpiece, and the top nut. If all this is dizzying to the aspiring student, just remember it may have been the same for a very young Itzhak Perlman too.